Syria War Report: Nation-Wide Ceasefire, Kurdish YPG Forces Withdrawing from Aleppo City? On December 29, preliminary reports appeared that an evacuation agreement were made between the Syrian military and militants operating in Syrian Ayn al-Fijah, Baseema and Dayr Qanoon in the Wadi Barda region northwest of Damascus. Local sources reported that militants are divided over the withdrawal issue. So, most likely, the Syrian military will be pushed to make a series of separate of withdrawal agreements until the whole region is liberated. A day before, on December 28, the Syrian army and Hezbollah, backed up by the Syrian Air Force, continued to storm Jabhat Fatah al-Sham and Ahrar al-Sham defense lines. Clashes were reported at the villages of Souq Wadi Barada, Kafr al-Awamid, al-Husyaniyah and Baseema. 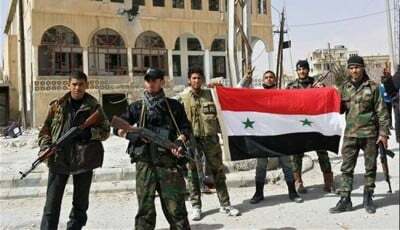 As a result, the Syrian army and Hezbollah entered Baseema and seized a number of buildings there. According to local sources, a part of militants holding a defense line there just fled to Dayr Qanoon and Kafr Az Zayt where no clashes were reported. About 20 militants were reportedly killed in the operation. Kurdish YPG forces are withdrawing from the Sheikh Maqsoud neighborhood of Aleppo city, according to reports circulating in YPG- and rebel-linked media outlets and social media accounts. The Ara News press agency reported on Tuesday that about 50 YPG fighters had already left the neighborhood and headed towards the northern countryside of Aleppo. Nonetheless, this report cannot be confirmed independently. Earlier in December, information appeared that the Syrian government was going to demilitarize Sheikh Maqsoud after the YPG or the SDF how the mainstream media prefers to call Kurdish forces allegedly decided to accept into its ranks a group of 250 Fatah Halab militants that had fled from eastern Aleppo. If this decision is confirmed, the real reason of possible tensions between YPG/SDF units and pro-government forces in Aleppo will be exposed. On December 28, the Turkish state-run Anadolu news agency reported that Turkey and Russia had agreed for a nation-wide ceasefire effort in Syria that was set to be launched at midnight local time on December 29. After Russian presidential spokesman Dmitry Peskov declined to comment on the agreement, Turkey’s Foreign Minister Mevlut Cavusoglu was pushed to clarify that the two countries had only prepared a text of the truce accord to be presented to the warring parties. On December 29, Russia’s President Vladimir Putin said that the Syrian government and armed opposition groups have reached an agreement on a ceasefire in Syria and on readiness to start peace talks.